Is Bravecto (Fluralaner) Safe For Australian Shepherds? Is Bravecto (Fluralaner) safe for Aussies? Comments for Is Bravecto (Fluralaner) Safe For Australian Shepherds? Generally, the concern is sensitivity to drugs due to the MDR1 gene mutation. According to this study... "No adverse events were observed subsequent to fluralaner treatment of MDR1(-/-) Collies at three times the highest expected clinical dose." Read this article for more information about the MDR1 gene mutation which also affects Australian Shepherds. That said, always consult with your vet before giving your dog medications as there may be other issues. I gave it to my Jethro who is 5 years old and there were no adverse effects whatsoever and it worked. I have tried the collars and men's that you put on the fur but this worked like a charm! 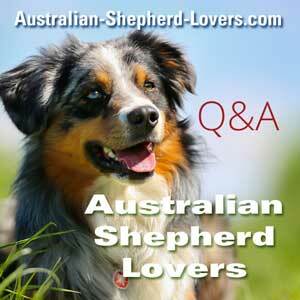 We have 2 Aussies, the one became very lethargic on Bravecto, and gained weight. This improved shortly after stopping it. I tried it a second time and the same thing happened. Too bad, because it was so convenient and effective! No it's not safe. The MDR1 gene test was very small, just 16 dogs in test & 8 got Bravecto & 8 a placebo. There are a lot of MDR1 gene breeds listed in reported deaths. 70,000 Does BRAVECTO Kill Dogs? My dog died last year, suffering from several inexplicable and terribly painful symptoms, 10 days after I had given him Bravecto. My vet reported he had never experienced this before and did not rule out that Bravecto had caused my dog's death. There has been a whole lot if controversy around this drug and its two sister drugs, Nexgard and Simparica. These three are listed as a new group of drugs called Isoxazolines, and are neurotoxins. Thousands of dogs have experienced serious adverse reactions after taking either of these drugs, a large numbers of the reported cases ending in death. In some cases death came instant and in other cases only after a long time of suffering of the dog. My brother's dog (a Labrador) became completely blind after two doses of Bravecto and only now, after more than a year of no Bravecto at all, does she show signs of recovering her vision. There is not enough known about these comparatively new drugs on the market, especially in the long term, and I definitely DO NOT recommend administering them to ANY dog, at ANY age. Not only dogs with MDR1, but all dogs are at risk. MDR1 dogs, however, feature high on the list of mortality rate after any of the three drugs involved. Bravecto and other chemical drugs are dangerous to animals, humans and environment! Do not use Bravecto! Just read FB site Does Bravecto Kill Dogs? Dogs are suffering terribly. It may not be after the first dose as in my dog .There's no antidote .Liver detox essential. MILK THISTLE DANDELION ROOT AND LEAF AND ALBIZZIA drops. Get it made up by a herbalist. My Husky German Shepherd cross, Lady, had to be put down one month after receiving a Bravecto tablet. She was given the tablet on 14/5/17, and a month later, she was reduced to being completely paralyzed, totally lethargic, panting, with next to no appetite. A full blood analysis showed there were no adverse illnesses. Lady was in perfect health, just as she was before receiving the tablet. We'll never know exactly what the cause was, but I'll never forgive myself for giving her the tablet. I went against my better judgement, after reading about many cases of dogs becoming sick after Bravecto. I discussed it with the vet, who assured me that it was quite safe for dogs to have the tablet. But now, I can't change what has happened. I would give anything to have Lady back. We rescued her from the streets of Romania 9 years ago, and brought her back to Germany where she lived a grateful, active, fulfilled life in our loving care. She did not deserve to have her life end prematurely. I've owned dogs all my life, but Lady was very special. I'm going to do the best I can to put the word out there about this poisonous, pesticide laced tablet. The active ingredient, Fluralaner, is no different to what farmers spray their crops with, and it certainly has no place on any of our four legged friends. All dog owners should make every effort to inform themselves before giving any chemical treatments to their pets. Do not simply rely on the advice and recommendations of so called professionals. Once upon a time, in the 1960s, they also told pregnant women that it was safe to take Thalidomide. Thousands of women gave birth to a generation of deformed babies, of which only around 50% survived. Lady, you will be in our hearts forever. My beautiful sweet Emmy Lu had a reaction 3 days after the 2nd dose. Unfortunately I attributed her extreme lethargy to something else. Immediately after the 3rd dose she began to have seizures and died 12 hours later. If you want to kill your pet, I highly recommend using it. Very effective, unfortunately. I allowed my vet to administer Bravecto to 5 of my GSD's, a decision I will regret for the rest of my life. I found Shadow 48 hrs later in seizure and despite everything I did she died in my arms, Max and Cujo began a downhill slide within days of receiving Bravecto and despite numerous visits and a multitude of tests by my vet, with no explanation of what was happening to them they just wasted away to the point the only humane thing was to euthanize them, this was the hardest decision I have ever had to make.the other 2 tolerated the drug, but not without issues. They too suffered rapid weight loss, diarreha and vomiting but survived.All 5 were in great health with no underlying issues prior to being given this poison and I live with the quilt and loss daily. Please, if you truly love your dogs, do not give this poison to them. The benefit is not worth the risk. The FDA estimates that only 1% of the dogs experiencing serious side effects and/or death are reported simply because the owners did not know about reporting or they didn't make the connection to Bravecto. Of my 15 GSD's 5 were given Bravecto. 3 died, 2 became seriously ill but survived. The other 10 did not need flea and tick drugs as the were either house pets or in concrete kennels and had absolutely no issues. The 5 that died or had health issues were extremely healthy and had no underlying issues. Bravecto is akin to Russian Roulette in that the game is not over til something dies. You may dodge the bullet for awhile but if it doesn't effect your dog outright, it will eventually shorten your dogs lifespan and health down the road. The benefit does not negate the risk and I will live with the loss and quilt of having given it to them for the rest of my life. My 4 year old Golden Doodle Louie was given Bravecto at the end of April. Just over a week later, he started to cough. That turned into foam and vomit. The emergency clinic kept him for four days and ran X-rays, blood etc. he was diagnosed with Aspiration Pneumonia due to Megaesophagus. They called it Ideopathic. No underlying illness had caused it. He lost 10 lbs. a couple of weeks later, X-rays showed pneumonia was cleared, and Megaesophagus had resolved. His esophagus looked normal. Now, 8 weeks later, the symptoms have returned. Megaesophagus is a lifetime condition, and in many cases cases, dogs die as a result of the ensuing aspiration pneumonia. My vet reported this to Merck. I Think Bravecto caused this. This dog was robust, and healthy, and then VERY SICK. I regret the day I listened to the vet who said it was safe. I am kicking myself that I didn't read these stories first. Please DO NOT GIVE YOUR DOGS this poison! Do not give this toxic poison to your dog! My otherwise healthy dog started having violent seizures, wouldn't eat, droopy eye and right side of his face, loss of balance, tremors and a general change in personality 10 days after simparica. I am one of the lucky ones because after several thousand in undiagnosed vet bills and a consult with a holistic vet and a thorough detox, he is almost 100% and has not had anymore seizures. Toxic poison. We wash our fruits and vegetables and. It organic to avoid this poison yet we pay high prices to feed it to our beloved pets. Please at least research it. The logical reason for pet parents to use a chemical against ticks and fleas, is to keep them these pests from climbing onto your pet in the first place. That considered, why then use these useless drugs, since they actually to not repel these insects. They are designed to be absorbed into the bloodstream of your pet, and the pests have to take blood meals from your precious fur kid in order to die. This means that even though the insect dies, your pet can still get tick borne diseases from infected ticks as well as tapeworm infestations form fleas.that carry these intestinal parasites. Exactly how does that make Bravecto, Nexgard or Simparica worth in any way, especially since your fur baby can die after taking these neurotoxins?? Think about it! Not safe for any dog! Sold as safe for MDRI gene breeds. Test was tiny, only 16 dogs in test of which 8 got Bravecto and 8 a placebo. The EMA have finally announced after the recent safely study that a seizure warning will be added to the oral tablet. Seizures already an admitted side effect to the ingredient Fluralaner on the spot on versions for dogs and cats. I gave my Aussie a tablet of Bravecto about a month ago and so far there have been no problems with his health. This is the second time I give you the Bravecto tablet and I usually take it for a Vectra 3D pipette. My baby is actually a Border Collie, and "coincidentally" was diagnosed with sudden onset vestibular syndrome 2 days after receiving Bravecto. One month later she still has a head tilt and poor coordination. Is it possible her vestibular syndrome is not related to Bravecto - yes certainly. But I've now read too many reports of coincidental seizures and vestibular syndrome in dogs within days of ingesting Bravecto. The main problem with this drug is that dog owners are usually not informed by their vet about the high number of reported side effects of these oral treatments (the same with similar products like Simparica, Nexgard, Credelio, Trifexis etc. ).